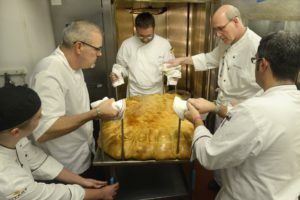 Chefs at Rivers Casino on Wednesday put Pittsburgh in the record book by preparing and serving what Guinness World Records has verified to be the world’s largest pierogi. More than a year in the making, the giant dumpling weighed 123 pounds, far exceeding the 110 pounds, 3 ounces needed to establish the record. 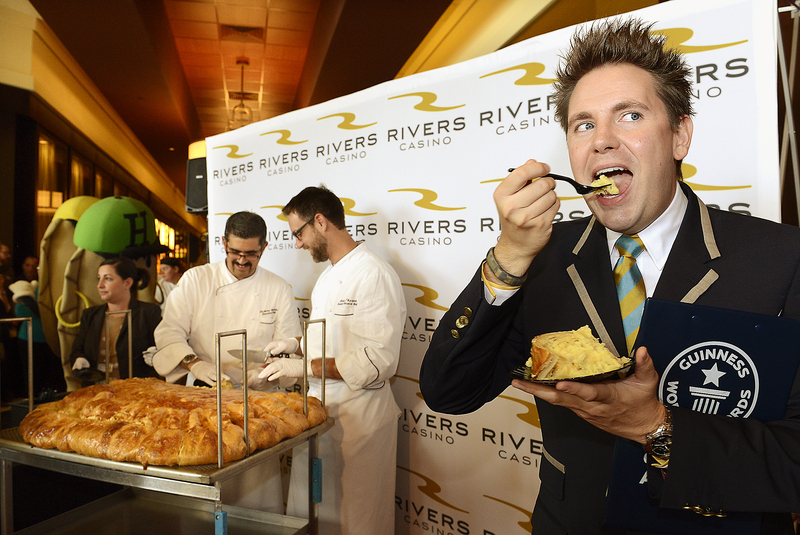 It was so big that the North Side casino’s facility team had to craft a 27-by-36-inch stainless-steel vessel in which to cook it. The project was presented to them a little more than a year ago by Shenandoah, Pa.-based Mrs. T’s Pierogies, which six years ago founded National Pierogi Day through Chase’s Calendar of Events. The chefs started rolling out the 42-pound ball of dough at about 5 a.m. Wednesday. Shaping it by hand to fit the specialty vessel, they then filled the giant disk with 82 pounds of cheddar cheese-flavored mashed potatoes. Then they flopped the dough over on itself to create a half-moon dumpling. After rolling and crimping the edges by hand, the pierogi was lowered into a kettle of hot water. Pierogies typically are boiled until they float, “but we kept it to a simmer because we weren’t sure if it would blow apart at a hard boil,” said Mr. Marmion. Then it was into the oven for 90 minutes. By 8:35 a.m., it was ready to be weighed. Perfecting a pierogi dough that was both strong and pliable but still nice to roll out took some doing, said Mr. Tharpe. The winning recipe includes more than 25 pounds of flour, 1 gallon of water, 16 eggs, 3 cups of oil and 2 1/2 pounds of sour cream. Much as they would have loved to fry the boiled pierogi as per tradition, doing so would have proven too dangerous, said Mr. Marmion. Except . . . it isn’t. Pagach (pronounced puh-GHACH) — dough-wrapped bundles of mashed potatoes, sauerkraut or shredded sweet cabbage — always are made with a yeast dough, notes Helen Mannarino of Pierogies Plus in McKees Rocks. Pierogi dough has flour, eggs, water and salt. My beloved pumpkin has been getting a bad rap lately. More than a few of my fellow food-lovers have been calling it out on Twitter, bemoaning what they consider the over-exposure and over-commercialization of one of fall’s favorite fruits. So she might have a point. Pumpkin spice no longer is relegated to ales, Starbucks lattes or that (really delicious) cream cheese spread at Bruegger’s that I love to pair with a pumpkin bagel. It’s practically everywhere, even where it might not logically belong. Pumpkin-spice Oreos are now A Thing. So is Quaker Oats Pumpkin Spice Instant Oatmeal, Chobani Pumpkin Spice Greek Yogurt and Nestle Toll House Pumpkin Spice Morsels. From Wrigley’s — a name we associate with spearmint, peppermint and Juicy Fruit — we get a seasonal pumpkin-spice variety of Extra gum. Heck, there’s even a pumpkin-spice-flavored dog treat from Twistex. So true. But still, as much as I agree it’s time to stop the madness, I also just can’t get enough. While I’ll pass on a slice of pumpkin pie every time during the holidays (I can’t stand the texture), anything and everything else into which I can stir a little Libby’s pure pumpkin is a winning dish in my book. Puree adds body to sauces and gives baked goods added moistness. “When you begin to think of pumpkin as both a flavor and a softening and moistening superstar, your baking world will open up wide,” writes Averie Sunshine in the new “Cooking with Pumpkin: Recipes That Go Beyond the Pie” (Countryman, 2014, $16.95). And she’s not just talking traditional cakes and cookies, of which she shares many recipes. The cookbook entices with pumpkin brownies, doughnuts, dinner rolls and shortbread, too. Understanding we’re all pressed for time, she presents each recipe in a way that maximizes success with the least amount of time and energy spent as possible, and that results in modest quantities. (Do you really want four dozen cookies tempting you after work? I know I don’t.) “I want you to make these recipes, not just talk about making them,” she writes. Pure pumpkin, it should be noted, is pretty good for you. Low in cholesterol, calories andsaturated fat, it’s a great source of dietary fiber, and completely knocks it out of the park when it comes to vitamin A, key for good vision and a healthy immune system — one serving provides more than 200 percent of daily requirements. Got a little more time for slicing and dicing? The silky, delicate flavor of fresh pumpkin is even better, if tackling its thick skin with a paring knife takes a bit of courage. Cubed pumpkin is terrific in soups and stews (I recently added it to a pot roast), and also makes a great filling forravioli and empanadas. Cut a hollow in the center, it also can be stuffed. Perhaps you’d rather focus your culinary skills on that aromatic mixture of cinnamon, ginger,allspice, cloves, nutmeg and mace that makes the house smell so good at Thanksgiving. Holisitic nutritionist Stephanie Pedersen has come up with a collection of recipes that bring these warming spices together. The autumnal delights in the new “The Pumpkin Pie Spice Cookbook” (Sterling, Sept. 2014, $12.95) include everything from pumpkin crostini and spicy pumpkin waffles to savory dishes such as slow cooker pulled pork, pumpkin sloppy Joes and Afghani-style sweet stew. There’s nothing like the flavor of pumpkin or pumpkin spice to bring warmth to a crisp, fall day. One of fall’s quintessential drinks is a pumpkin-spice latte. But why put money in Starbucks pocket when you can flavor your coffee at home so easily? And with no artificial ingredients? 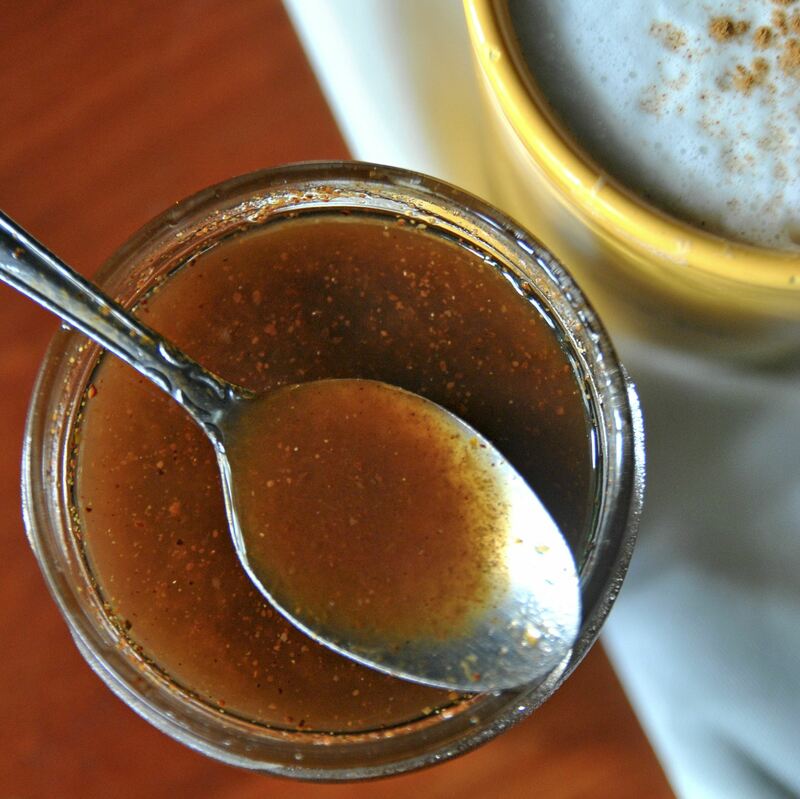 This simple, spicy pumpkin syrup comes together in minutes and keeps in the fridge for up to a month. If you don’t like floaters in your coffee, you’ll probably want to strain the syrup through a coffee filter or cheesecloth to remove the undissolved spices before transferring to a jar. But even unfiltered, it’s delicious. They syrup also can be drizzled over ice cream, pancakes, waffles, cake … anything you’d like to punch up with a little pumpkin flavor. It also can be stirred into hot chocolate, milk or smoothies. Yum. Combine sugar and water in a medium saucepan. Cook over medium heat, whisking constantly until sugar is dissolved. Add pumpkin and spices and whisk to incorporate. Cook for about 10 minutes, stirring frequently so mixture does not come to a boil. Mixture will thicken and reduce in volume. Turn off heat and allow syrup to cool in the pan for about 15 minutes before transferring to a glass jar or heat-safe container with a lid. Syrup will keep airtight in the fridge for at least 1 month. Mix together flour, baking powder, baking soda, pumpkin pie spice and salt in a large bowl. In a second bowl, add eggs, sugar, pumpkin, milk and butter. Beat well. Gently fold in the flour mixture. Cook according to your waffle iron directions. Serve hot, with your choice of topping ingredients. This easy-to-make yeast dough also is extremely easy to work with, so don’t go telling me you can’t replicate Aunt Annie’s pretzels at home! Canned pumpkin gives the soft knots a pale orange color. I sprinkled them with salt but cinnamon sugar would be delicious, too. If you want to get really fancy, drizzle a little icing on top. Perfect for breakfast. Heat milk to lukewarm. In the bowl of a stand mixer, combine warm milk and sugar and sprinkle the yeast over it. Allow it to proof, getting bubbly and foamy, about 5 minutes. Add the egg, pumpkin, oil and salt and mix briefly with the paddle attachment on low speed to combine, about 1 minute. Add 2 1/2 cups flour and switch to dough hook when dough comes together and can be kneaded (or knead by hand). Knead for about 5 to 7 minutes, or until smooth and elastic. This is not a sticky dough and should be smooth. Turn dough out into a large mixing bowl coated with cooking spray, turning dough over once togrease the top. Cover with plastic wrap and place in a warm, draft-free place to rise until doubled in bulk, about 2 1/2 to 3 hours. Prepare 2 baking sheets by lining them with nonstick baking mats or spraying with cooking spray; set aside. Punch dough down. Turn out onto a lightly floured surface. Divide into 6 equally sized portions. (If you are making the dough ahead, wrap dough balls in plastic wrap and refrigerate for up to 48 hours.) For smaller pretzels, divide dough into 12 equally sized portions. With your hands, roll each portion of dough into a long, thin rope, 24 to 28 inches long, and twist each rope into a pretzel. (Envision making a heart, with a twist in the middle,) Place 3 pretzels on each of the 2 prepared baking sheets. Cover with plastic wrap and allow pretzels to rise in a warm, draft-free place until nearly doubled, about 1 hour. Before baking pretzels, brush with melted butter; reserve remainder. Bake for 10 to 12 minutes, or until they’re golden, puffed and done. For firmer pretzels, allow to bake a little longer. 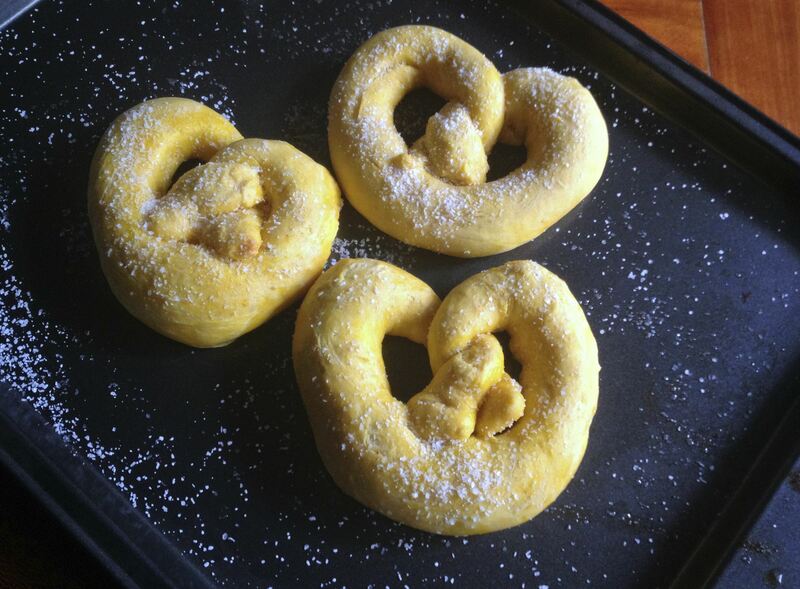 After baking, immediately brush pretzels with reserved melted butter and sprinkle with kosher salt. For a sweeter pretzel, dredge the buttered pretzels in a cinnamon-sugar mixture. Serve immediately, either as is or with mustard, horseradish, cream cheese or hummus. Pretzels are best warm and fresh, but will keep airtight for up to 48 hours. Makes 6 large or 12 small pretzels. You might not associate the Caribbean with pumpkin, but these Jamaican pastries — made with chunks of fresh pumpkin instead of canned puree — are so good. The butter crust, which is easy to make and forgiving under nervous fingers such as mine, practically melts in your mouth. The original recipe calls for calabaza, a pumpkin-like squash that’s popular in the Caribbean and South and Central America. I couldn’t find one (you may at a Latin market) so I subbed a pie pumpkin. Make pastry: Stir together flour and salt into a large bowl. With your hands, gently rub butter into the flour mixture until it achieves a sandy texture. Add water all at once and mix just until flour is incorporated and dough forms a mass. Warp dough in plastic and chill in refrigerator overnight. Remove 1 hour before use to let dough come to room temperature. Prepare filling: Warm oil in large saute pan over medium heat. Saute onions, scallion, garlic and ginger. When onions are wilted, stir in hot pepper and curry powder and cook for 2 to 3 minutes, until aromatic. Add cubed pumpkin and cilantro. Quickly toss with onions mixture, then pour in coconut milk, and simmer for 2 to 3 minutes. (It took my pumpkin about 10 minutes to become tender enough to smash.) Season with salt and pepper. Smash pumpkin mixture with a potato masher and let cool before filling the patties. 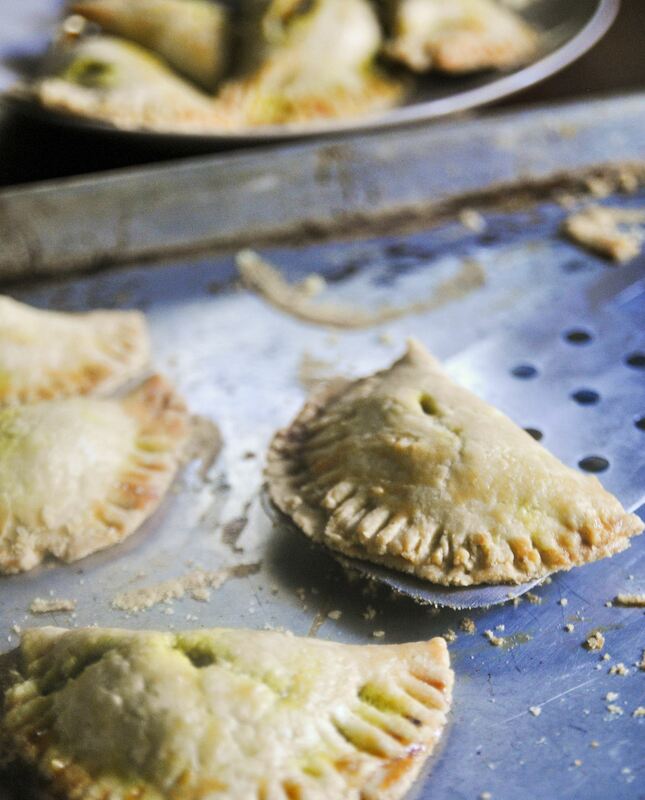 Make patties: Preheat oven to 375 degrees. Divide dough into 4 portions. Roll out each portion 1/8-inch thick and cut into 4-inch circles, creating as little waste as possible. Leftover dough may be tightly wrapped in plastic and frozen for up to 2 weeks. Fill each circle of pasty with about 1 tablespoon filling, then fold pastry in half and crimp edges with a fork to seal. Score top of each pastry and brush with egg wash. Bake for 30 to 35 minutes or until tops are golden brown. Makes 18 to 20 patties. Vegans, unite. This soup recipe just might make believers out of us meat eaters. Coconut milk imparts the broth with a silky smoothness while cayenne adds just the right amount of heat. 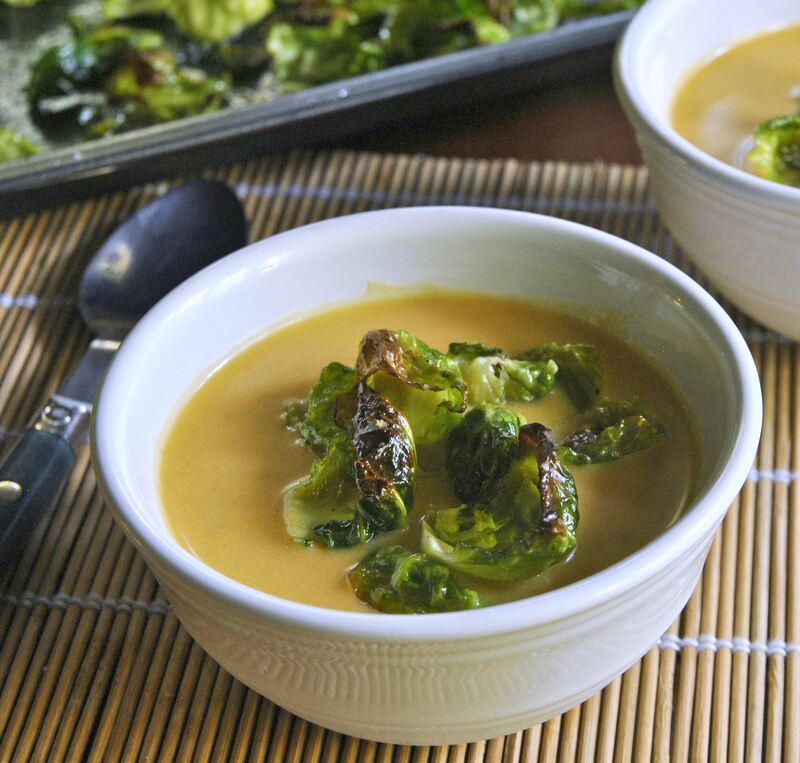 Roasted Brussels sprout leaves give my favorite soup topping — potato chips — a run for the money. Plus, they add vitamins. I kicked the soup’s flavor up a notch with double the amount of cayenne. For soup: In a large pot, heat oil over medium-high heat and saute onion and apple until soft, 10 to 15 minutes. Add garlic, salt and cayenne and let cook for 1 minute more, until fragrant. Add broth and pumpkin, and bring to a boil. Remove from heat and in batches, transfer soup to ablender and puree until smooth. Return to pot, stir in coconut milk and brown sugar, reheat and season to taste. For crispy leaves: Preheat oven to 375 degrees. Spread Brussels sprout leaves on a large rimmed baking sheet and toss with oil. Season with salt and pepper and bake for 10 to 12 minutes, until lightly browned and crisp. To serve: Divide soup into bowls and top with a spoonful of crispy Brussels sprout leaves. My daughter Catherine is continually asking me to make her cheesecake. Too bad she’s now off to college, because this super-rich recipe from country star Martina McBride is a winner. I think it’s because of the 3-ingredient crust, which swaps gingersnap cookies for traditional graham crackers. The flavors of spicy ginger and pumpkin marry beautifully. 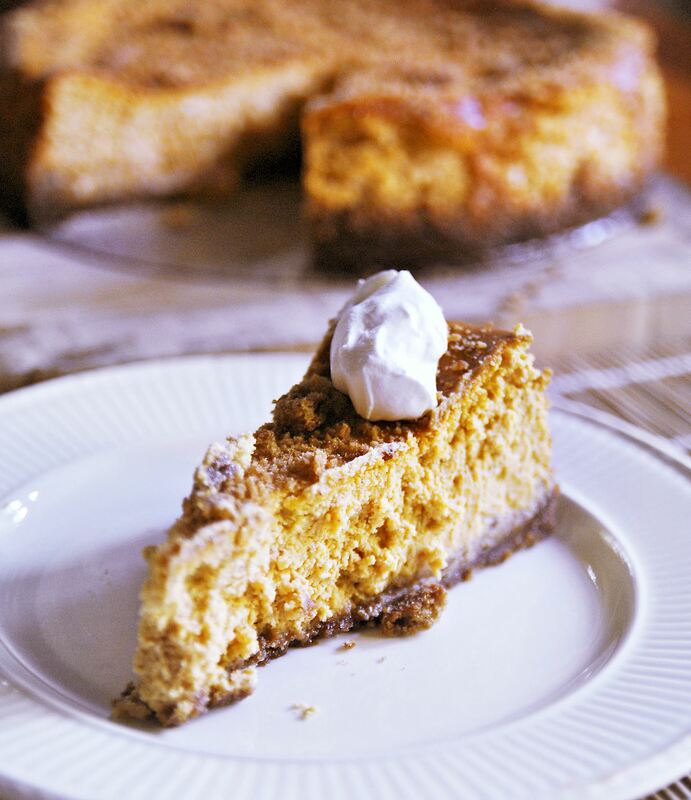 If you don’t have all the ground spices on hand, substitute 2 1/4 teaspoons pumpkin-pie spice. I ended up eating my Heath bar long before the cheesecake finished chilling in the fridge, so sprinkled crumbled gingersnaps on top. 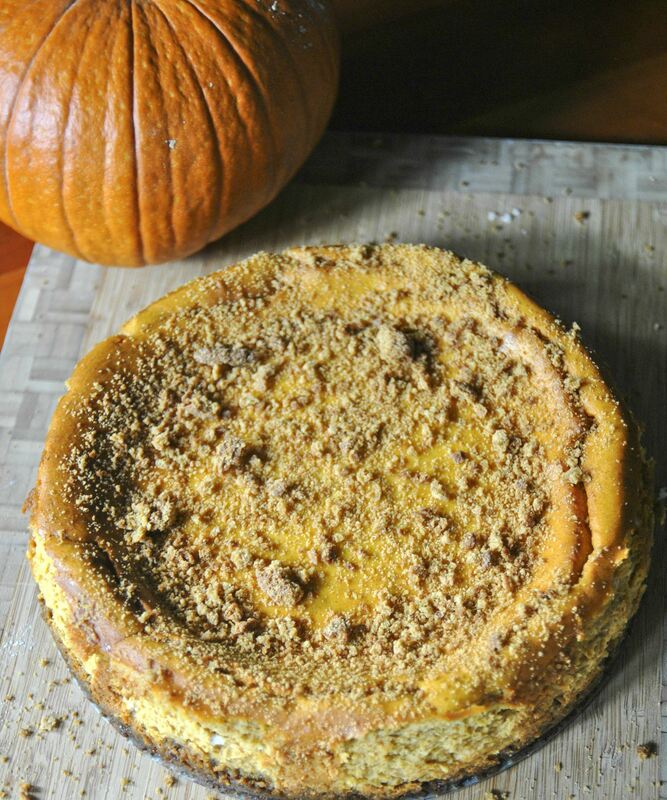 Perfect for National Pumpkin Cheesecake Day on Oct. 21! Prepare a 9-inch springform pan by tracing it onto a sheet of parchment paper. Lightly grease bottom of pan. Cut out round of parchment and place it in the greased pan and then lightly grease the paper. Preheat oven to 350 degrees. Place crushed gingersnaps and brown sugar in a food processor and process until finely chopped. Add melted butter and process until thoroughly combined. Press the mixture into the bottom and up sides of the springform pan. Chill for 10 to 20 minutes. Beat the cream cheese and granulated sugar in a medium bowl with an electric mixer until light and fluffy. Add cinnamon, allspice, ginger and nutmeg and mix until combined. Add eggs, one at a time, mixing just until yolk disappears. Add cream, vanilla and pumpkin puree, mixing to just combine. Remove crust from the refrigerator. Pour cheesecake batter into prepared crust. Bake 1 hour and 15 minutes, or until center is almost set. Run a sharp knife around the edge of cheesecake to help prevent it from cracking as it cools. Let cheesecake cool at least 30 minutes. Cover and chill in the refrigerator overnight. To serve, remove cheesecake from pan and transfer it to a serving plate. Slice into 10 to 12 wedges and top each with a dollop of whipped cream and a sprinkle of crushed gingersnaps or finely crushed Heath toffee bar. BENTON, Pa. — Come September, when apples hang ripe and heavy on the tree in this tiny, rural corner of Columbia County, Bob Antanitis stands ready. No doubt there’s a giant smile spread across his mustachioed face. Time to make cider! Not the sweet and cloudy, kid-friendly variety sold at farm markets and roadside stands, mind you. (Though who can say “No” to that classic taste of autumn?) 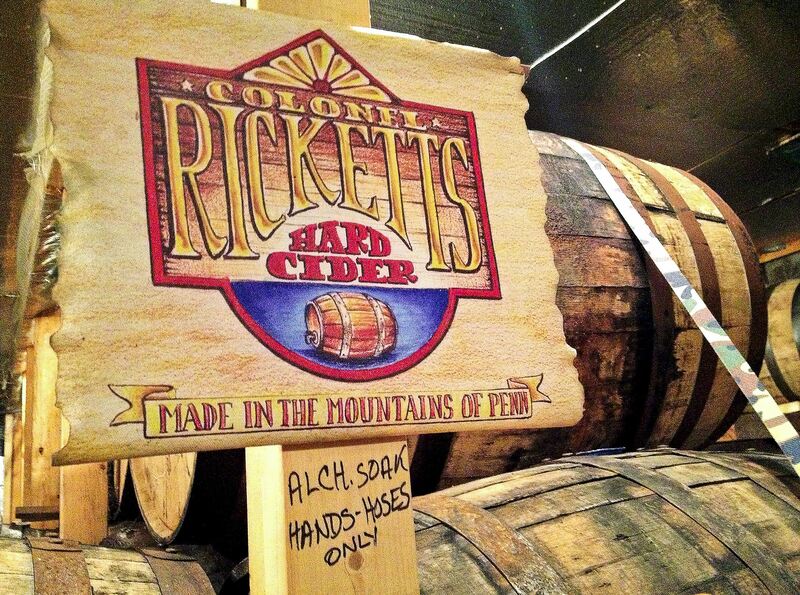 We’re talking the good stuff from Colonel Ricketts Hard Cider Winery, the small cidery he started four years ago. In 2007, on what he cheerfully admits was a whim, the Luzerne County native purchased a commercial cider press at auction. Friends and family loved the cider he’d jugged in the past, and with this hydraulic system, he figured he could make a ton of it. He even had a ready place to put it: a three-sided building his father-in-law, Miles, had used as a wood-drying kiln for his lumber biz, the Little Lumber Co.
As he played around with the press and different apple combinations over the next two years, however, the seed of an idea grew in his head. He really could fill a lot of barrels with the press, a big green monster of a machine capable, at full throttle, of turning 40 bushes of apples into about 130 gallons of cider. Why not ferment and bottle it, and then try to sell it? Locals have been pressing, fermenting and aging small batches of traditional hard cider for generations in this northeastern part of the state. Mr. Antanitis himself started making hard cider in his basement as a hobby some 30 years ago, after he married his wife, Debbie, and moved from Trucksville to Benton. “That was my introduction to moving there,” he says with a chuckle, describing how his father-in-law led the way. “It was one of the things guys would do — make it, put it in jugs and give it away to friends.” At one time, he had two barrels in his cellar. 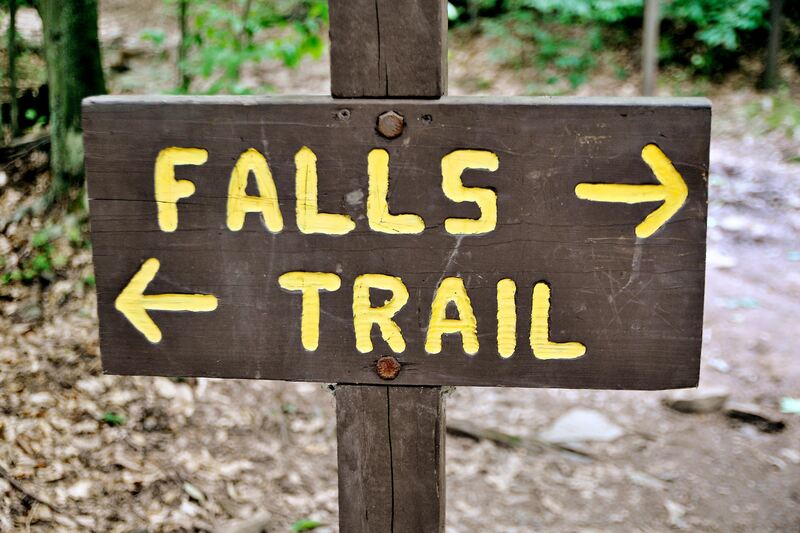 Mr. Antanitis knew, then, there was a taste for the alcoholic drink, and not just in and around Columbia County. Thanks to America’s growing love affair with craft beers and cocktails, hard cider is experiencing something of a renaissance across the U.S. According to The Beer Institute, American hard-cider production has more than tripled in the past two years, exploding from 9.4 million gallons in 2011 to 32 million in 2013. And a 2012 Neilson Report says that hard cider is “poised for great growth” because it appeals to more affluent, nontraditional beer drinkers — women, who prefer its sweeter taste, and Gen Y-ers, who have gravitated toward wine, spirits and craft beer. “Innovative cider offerings keep the millennials engaged,” notes the report. Blessed with a head for business — he ran two lumber yards over 23 years for his father-in-law before the business closed in 2000 — Mr. Antanitis realized cider’s potential. When it came to naming the cider he’d eventually start selling at the big white Green Acres Barn at the north end of town, at the corner of Route 487 and Green Acres Road, one local name immediately came to mind. Native son Colonel Robert Bruce Ricketts was a Civil War veteran-turned-lumber baron/land speculator who’d won honors for his valor on Cemetery Hill on the second day of the Battle of Gettysburg. After his death in 1918, many of his 66,000 accumulated acres were sold to the Pennsylvania State Game Lands, and that became the nucleus for Ricketts Glen State Park. 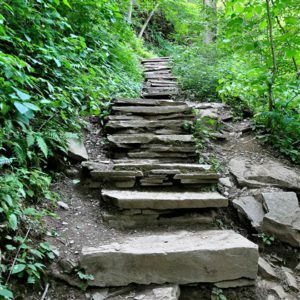 Opened in 1944, it’s one of the state’s 20 “must-see” parks, thanks to the trails Col. Ricketts built along its 24 named waterfalls. Says Mr. Antanitis, “Everyone knows it.” Why not capitalize on that famous name? Hard cider has a long, if sometimes forgotten, history in the U.S. 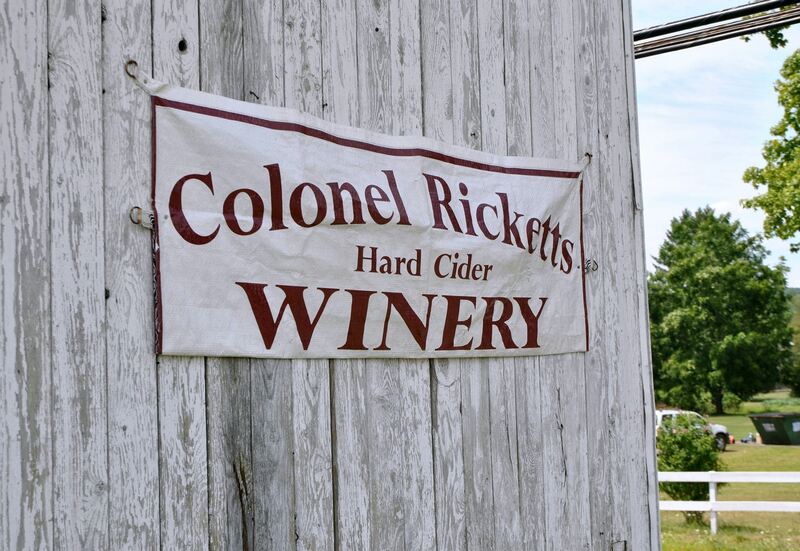 Colonel Ricketts Hard Cider tasting room is located in an 80-year-old bank barn in Benton, Pa.
Apple trees for cider production were among the first fruits planted by British colonists upon arrival in the New England. 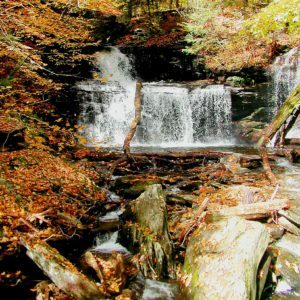 Public sources of water were not fit to drink from back in merry-but-unsanitary old England, notes Dave Williams of George Mason University, so the colonists initially distrusted the streams and rivers in the new world, too. Cider sanitized dirty water. Plus, it tasted good. More stable on pantry shelves than fresh-pressed juices and cheaper to make than beer or whiskey, hard cider quickly became the alcoholic drink of choice. A few famous people loved it, too. Our second president, John Adams, reportedly drank hard cider regularly at breakfast to “soothe his stomach.“ And during his “log cabin campaign” for president in 1840, William Henry Harrison promoted himself as the “hard cider candidate” from the rough-and-tumble West. He lost, but the point was made: Cider was the drink of the common man. Tastes changed as the country grew more urbanized and industrialized. A rise in the number of German immigrants brewing beer in the late 1800s took a hard toll on hard cider, which typically was produced on site near the orchards or in towns surrounded by apple trees. By the time Prohibition rolled around in the 1920s, the once-popular drink had all but disappeared. It wasn’t until the early 2000s, on the smoking hot heels of the craft-beer revolution, that hard cider started making a comeback. The more people tasted it, the more they wanted it. Along with Vermont’s top-selling Woodchuck — purchased by C&C Group of Dublin for $305 million in 2012 — some of the biggest names in the brewing business now offer the drink, includingAnheuser-Busch (Johnny Appleseed), Boston Beer Company (Angry Orchard) and Miller-Coors (Crispin and the brand-new Smith & Forge). While making cider is fun, all the red tape involved in getting the business up and running was not. 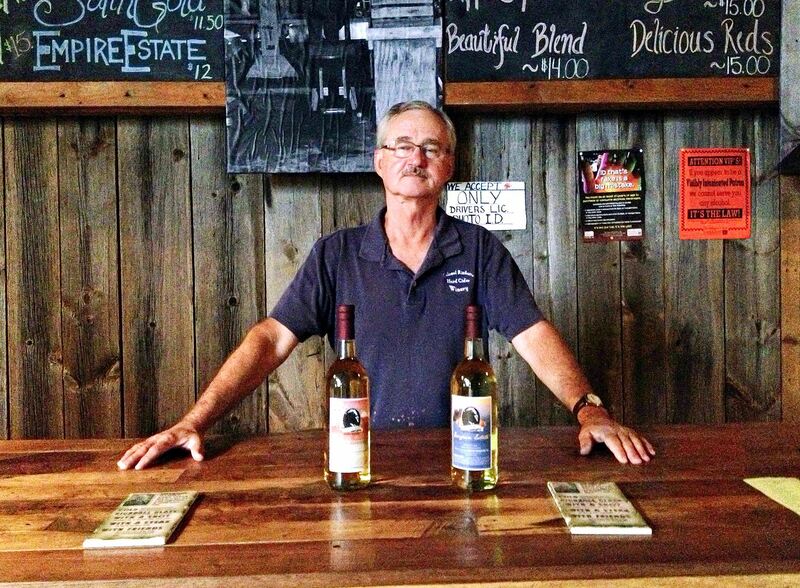 Before he could sell his first bottle, Mr. Antanitis needed a winery permit, a process that took more than six months. He also had to jump through hoops with the label, which features a picture of the distinguished colonel late in life, with white hair and mustache. The first ones simply read “Colonel Ricketts Hard Cider.” Problem was, the government defines “hard cider” as a subset of wine containing less than 7 percent alcohol by volume — and his product ranges from 9.3 to 15 percent alcohol by volume. So they were rejected. The process of cider-making is fairly simple: After sorting, washing and chopping the apples, they’re ground into pommage, then pressed in a rack of trays seven layers deep for 15 minutes. As the juice flows out of the trays, it drains to a reservoir, where it’s pumped to a stainless-steel storage tank. It’s then filtered, fermented and aged for up to a year in 55-gallon oak barrels. Before the finished cider is bottled, it’s filtered three more times. What sets Colonel Ricketts’ product apart from the competition, says Mr. Antanitis, is the fact it’s aged in Jack Daniels’ barrels. Charred on the inside, the whiskey-infused wood imparts a unique flavor into the cider. First, you smell the barrel. Then, you taste it. Each sip finishes with a “Jack aftertaste,” he says. Also, it’s not carbonized like the Woodchucks and Angry Orchards of the world, he added. Because his is a “true” hard cider, it’s also not pasteurized. At a time when simple, locally sourced food is the rage, Colonel Ricketts Hard Cider is about as simple a product as you can get. All the apples comes from local orchards — spicy McIntosh, tart Stayman and Red and Golden Delicious are common varieties — and the only other ingredients are sugar, yeast and salicylic acid, which prevents sediment from forming. Also, nothing goes to waste. The cake-like remains of the ground-up apples (each layer of pommage weighs about 2 1/2 pounds after pressing) is given to local farms to feed pigs. Each year brings new flavors, depending on the available apple varieties and growing conditions. Best-sellers typically include Colonel Ricketts’ semi-dry “Original” cider, made with a blend of five apples, and Fuji Fantastic, a semi-sweet cider with a tart finish. The 750-milliliter bottles are priced from $10.50 to $18. Not sure what you like? 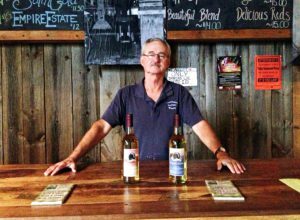 From Memorial Day through the first weekend in November, you can get a free sampling of five varieties at the cidery’s tasting roof in Green Acres Barn, which in summer also hosts the Benton Farmers Market. 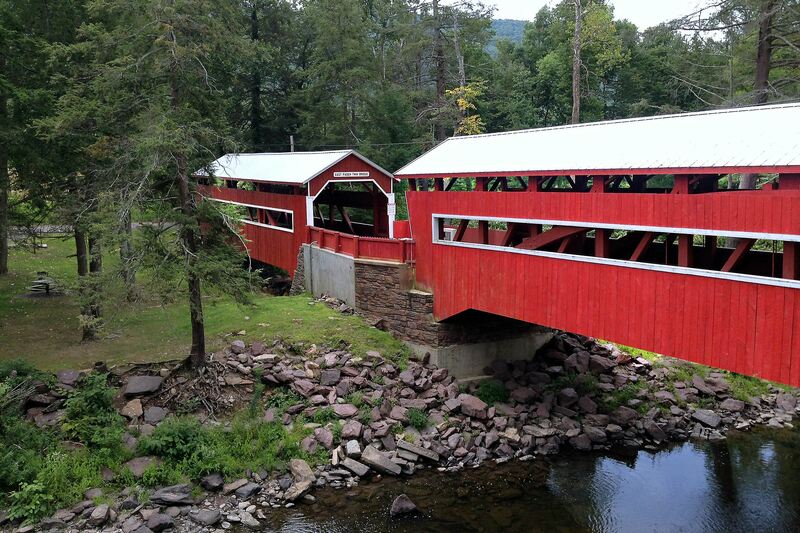 Purchased in 1960 to store lumber and other products, it’s about as charming a place to enjoy a drink as you’ll ever find. 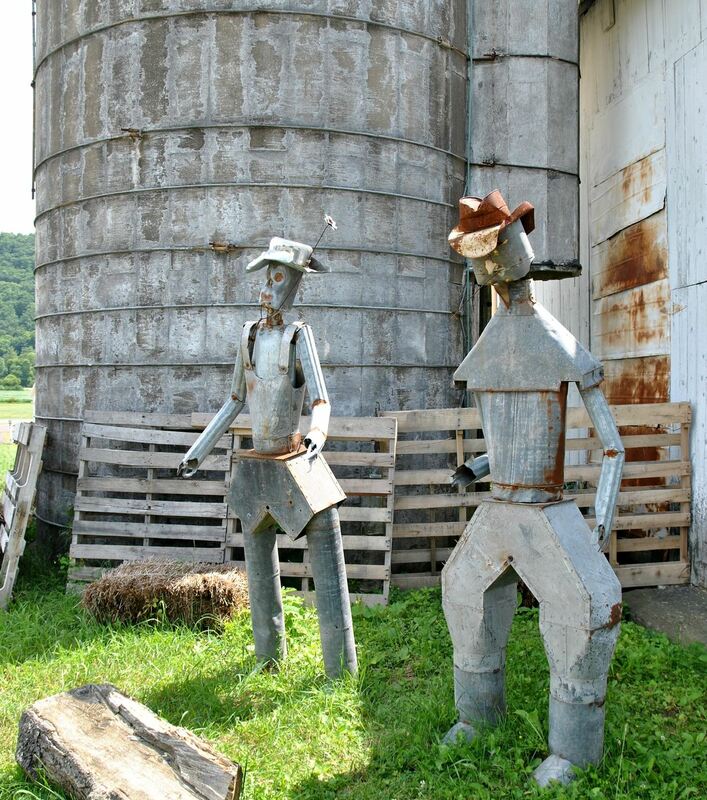 All kinds of farm tools, antique vehicles and other found art are displayed under its lofty roof, along with local honey for sale and quirky tin sculptures by local artist Rich Dumond. The rest of the year you can sample and buy at the winery a few blocks away on Third Street (they’ve had visitors from as far away as Russia and Switzerland), or at a second location in Lewisburg manned by Mr. Antanitis’ son, Robert, who liked making cider with his father so much that he got his own winery permit. Neither is making a living off it quite yet, but sales are brisk enough that there’s hope, along with some money in the checking account, Mr. Antanitis says with a laugh. 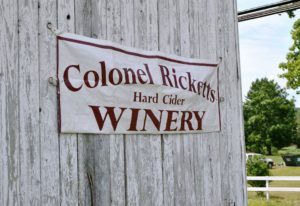 Colonel Ricketts Ciderworks and Hard Cider Winery is located at 126 S. Third Street in Benton, 15 miles north of Bloomsburg and 8 miles south of Ricketts Glen State Park. From April through the first weekend of November, you can buy and sample the cider in the big white barn at the corner of Route 487 and Green Acres Road (Benton Farmers Market); the rest of the year you can buy and sample at the winery. Hours are noon to 6 p.m. Fri., 11 a.m. to 5 p.m. Sat., and noon to 4 p.m. Sun. For more info: 1-570–854–1948 and col­o­nel­rick­ettshard­cider­win­ery.com.